Vietnamese bakeries are like encapsulated fusion: French colonialism brought classical European bread and pastries, then combined with the Vietnamese and Southeast Asian penchant for exploring the boundaries of sweet and savory, with an added post-emigration Southeast Louisiana twist. The relatively recent popularity of Vietnamese food rests on the shoulders of a local food subculture that has always nurtured and fed its community, even as it widens. The French occupation of Vietnam from 1887-1954 created a demand for European-focused pastry, which then became the root of Vietnamese baking culture. New Orleans food writer Lorin Gaudin, something of a local Vietnamese culinary ambassador, experienced the food for the first time in Paris in 1989 with her native New Orleanian husband. “We had no idea that Vietnamese food was even in New Orleans” back then, she said. The late 1970s brought almost half a million Vietnamese refugees to the United States after the fall of Saigon in 1975. In New Orleans, resettlement efforts by the Catholic Church has resulted in a Vietnamese population of more than 15,000 people, 40 years later. Originally, the bulk of immigrants and refugees were settled in the Versailles apartments in New Orleans East, but pockets found their way to the West Bank in Algiers, Gretna, and Marrero. Pockets of Vietnamese communities in the New Orleans area have historically been insular, although a greater knowledge of its cuisine has passed through the cultural barriers in the last 10 years. Since Katrina, more non-Vietnamese residents have learned about pho and banh mi (originally marketed as “Vietnamese po-boys”) and young chefs take cues from the flavor profiles of Southeast Asia for their menus. There are more Vietnamese restaurants in decidedly non-Vietnamese neighborhoods like Uptown, Mid-City, and even the French Quarter. The Dong Phuong bakery is a significant culinary and cultural landmark of Southern Louisiana’s Vietnamese eateries. Opened in 1981 by immigrants De and Huong Tran, who moved to the Versailles neighborhood of New Orleans East upon their arrival in the United States, Dong Phuong literally means “East.” It, along with the Mary Queen of Vietnam Catholic church that served the predominantly Catholic residents, are the two pillars of the tight-knit Vietnamese community in Versailles and surrounding neighborhoods. Although there’s an attached sit-down restaurant, the bakery also supplies New Orleans-style French bread to dozens of Vietnamese and non-Vietnamese sandwich shops and restaurants, like Killer PoBoys, Saigon Slim’s, Beachbum Berry’s Latitude 29, and Boucherie. McClure’s BBQ uses Dong Phuong’s brioche rolls for its smoked meat sandwiches. 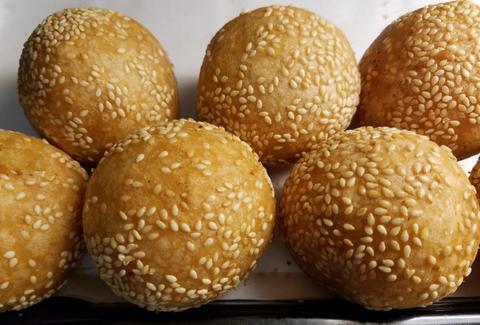 Dong Phuong also supplies other Asian sweet and savory baked goods such as mochi, yucca pies, tapioca cake, milk breads, and cream rolls to Vietnamese-focused stores like Kien Giang and the Hong Kong Market. 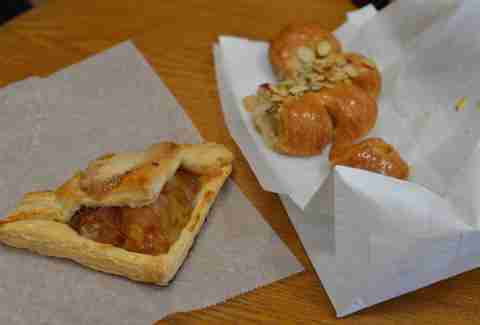 According to Gaudin, traditional Asian desserts tend to be either savory or super sweet, and sometimes the two tastes are combined, such as a meat pie made with sweet pastry dough. Inside the bakery, a pile of 7in French bread loaves greets visitors at the front door. Cream puffs, croissants, and coconut macaroons share shelf space with durian moon cakes, sweet mung bean rice cakes, and agar agar jellies. The banh mi counter has 17 different options, ranging from vegetarian to seafood to chicken to pork and beef: most only cost $3.25. 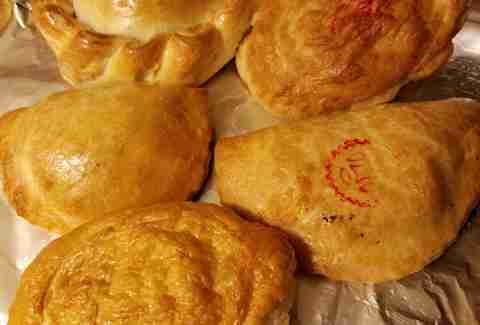 Don’t bypass the steamed pork buns or the trays of freshly baked pork-filled pâté chaud, and meat pies. Hi Do is located in Terrytown (a neighborhood in Gretna), on the West Bank. It produces daily loaves of French bread as well as sourdough rounds and buttery, hand rolled croissants, alongside other French pastries. 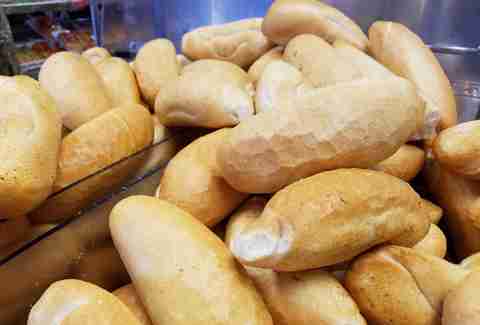 Several restaurants use Hi-Do’s French bread, including Pho Noi Viet on Magazine St.
Ho Do and his wife Huyen Nguyen own this beloved bakery, which opened after the two were reunited in Louisiana in 1991. Nguyen and their two daughters lived in Saigon under Communist rule for eight years after Do fled the country. Now, the pair and their family create several different types of dough from scratch every morning, shape them into dozens of pastries, and sell them to their devout following. They also supply baked goods for decidedly non-Vietnamese traditions and holidays. Their king cakes are found on many “best of” lists. Their hand-shaped breads in the form of crabs, crawfish, and alligators grace the Italian community’s St. Joseph altars in March. King cakes also come in different shapes, including a fleur-de-lis. O’Delice, located Uptown on Magazine St, has created French breakfast pastries, cookies, pies, muffins, petit fours, cakes to order, and other confectionary delights since 2004. 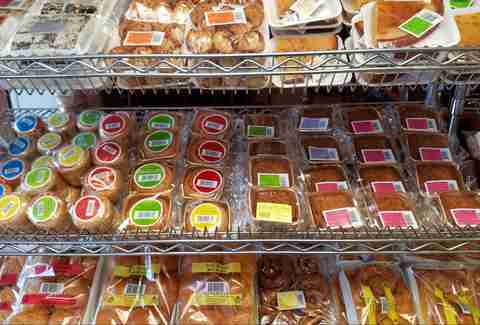 Nancy Nguyen runs the family business, which, like other local bakeries, gets an uptick in business during Carnival -- also known as King Cake season. Clicking through Chez Pierre French Bakery’s website, you’d never know it wasn’t run by French nationals -- evidenced by its name as well as its selection of classic French pastries like almond tarts or chocolate eclairs -- until you see the lunch menu. 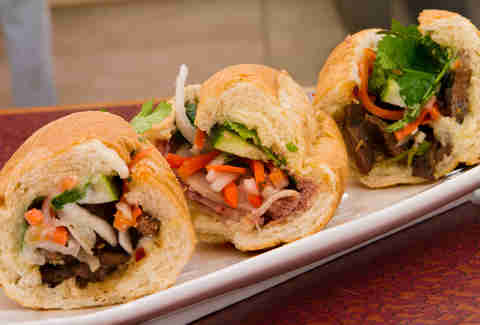 Pho, banh mi, co’m (a rice dish), and bun (a noodle dish) are offered in several variations at each of Chez Pierre’s three locations. Not only have New Orleans’ Vietnamese influences led to fantastic pho joints and banh mi shops throughout the city and surrounding environs, but the family-owned bakeries in NOLA East and on the West Bank serve as a base for cuisine and restaurants of all stripes. The Southeast Asian culture and cuisine that has crept into southeast Louisiana has also led to the combination of Vietnamese dishes with local ingredients -- not just banh mi sandwiches on menus at restaurants like Green Goddess, Latitude 29, and Boucherie, but a true fusion of the two cultures, both quite fond of pork, seafood, rice, and bold flavors. 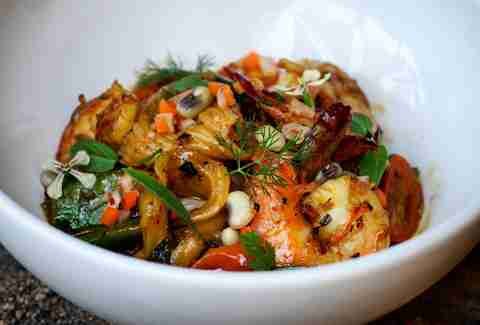 When Michael Gulotta opened Mopho in 2014, he quipped that he wanted to combine the flavors of the Mekong Delta with the Mississippi Delta. Pho with hogshead cheese, fried oyster banh mi, or a pork belly rice or noodle bowl topped with cracklins are a few examples of his interpretation of Vietnamese-Louisiana fusion. Pop-up restaurant The Old Portage does a weekly Vietnamese crawfish boil during the season. They boil the crawfish with curry, dried chiles, star anise, nam pla, basil, dried shrimp, ginger, lemongrass, sweet Vietnamese sausage, beech mushrooms, and pineapple -- with Dong Phuong French bread for sopping up the spicy, fragrant good stuff. The Old Portage chefs Jordan and Amarys Herndon also use Dong Phuong bread when they have banh mi on the menu, as well as for bread pudding. As one-time French colonies, both Vietnam and New Orleans bring traditions from Europe and Asia to one of the oldest cities in America. It may have taken 30 years for the flavors of this confectionery connection to find popularity outside of the cultural enclaves of Vietnamese communities, but it’s been an underlying influence all this time regardless. Note: Some information came from the well-researched work of Celeste Norris, Judy Walker, and Danielle Dreilinger, all for the Times-Picayune/NOLA.com. Richard Campanella’s book Bienville’s Dilemma: A Historical Geography of New Orleans was also helpful in confirming dates and locations of immigration patterns. Nora McGunnigle could really go for a banh mi right now. Follow her pho adventures on Twitter or Instagram.